Livy's History of Rome (T. Livii ab Urbe Condita Libri). Italy; Middle 15th Century. Latin Text; Humanistic Script. The known part of Livy's great life work, the History of Rome, was completed about the year 9 A.D. The finished work consisted of one hundred and forty-two books, of which only thirty-five are extant. These books are regarded as one of the most precious remains of Latin literature. One of the outstanding characteristics of the scholars and scribes of the Italian Renaissance was their great interest in Latin literature. 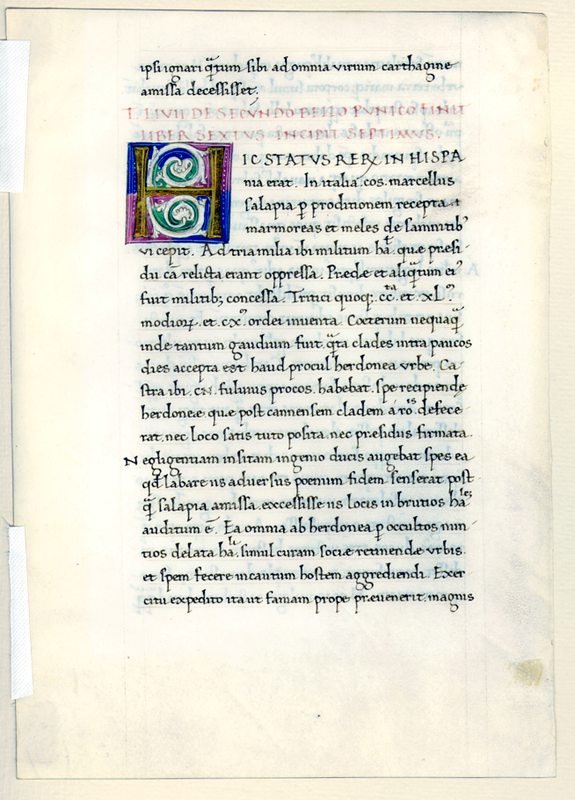 Through their influence, many copies of the classics were made from the few 9th and 10th century manuscripts available. These earlier manuscripts had been written in a carolingian or pre-gothic script to which the 15th century humanistic calligraphers assigned the name antiqua littera. The letters were not really of antiquity, since minuscule letters were not known before the time of Charlemagne. In the 15th century, this carolingian script became the inspiration not only for manuscripts like this leaf, but also, shortly thereafter, for the fine roman types designed by the printers in Italy. Text: This leaf contains text from Livy's History 26:51 to 27:1. The English translation is that of Cyrus Edmonds (1850), via Project Gutenberg. Reconstruction Note! In Ege's original manuscript, this leaf was followed by what is now Leaf 39 in the Ohio University portfolio. ipsi ignari quantum sibi ad omnia uirium Carthagine amissa decessisset. T. LIVII DE SECVNDO BELLO PVNICO. FINIT LIBER SEXTVS INCIPIT SEPTIMVS. ...far from ignorant how much their strength had been diminished, in every respect, by the loss of Carthage. T. LIVY ON THE SECOND PUNIC WAR. THE END OF THE 6TH BOOK AND THE START OF THE 7TH. retain possession of a city in alliance with him, and inspired a hope of attacking the enemy when unprepared.